As we age, the accumulated effects of sun, pollutants, acne, and scarring can damage our skin and cause us to look older than we actually are. 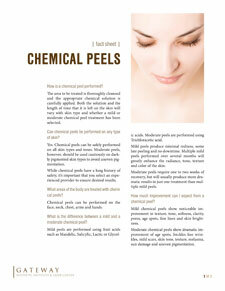 One way to treat and repair the skin is with a chemical peel. Chemical peels can be safely performed on all skin types and tones and can be performed on the face, neck, chest, arms, legs, and hands. While chemical peels have a long history of safety, it’s important that you select an experienced provider to ensure desired results..